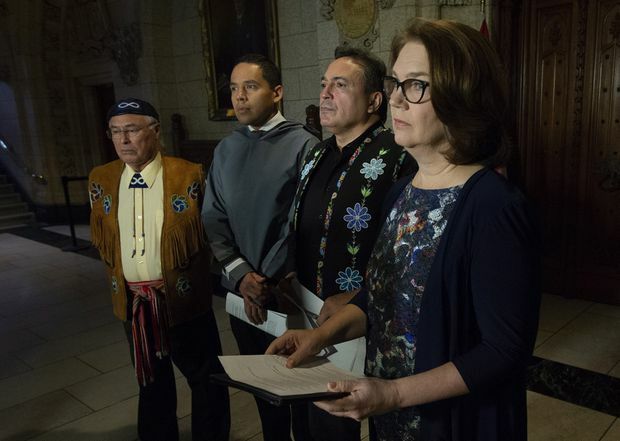 Indigenous Services Minister Jane Philpott, right, Assembly of First Nations Chief Perry Bellegarde, President of the Inuit Tapiriit Kanatami Natan Obed and Metis National Council President Clement Chartier, left, at a news conference in Ottawa, Nov. 30, 2018. The federal government is promising new legislation, developed in concert with Indigenous leaders and communities, that will divert First Nations, Inuit and Métis children from foster care and end long-standing practices in child welfare that rip apart Indigenous families. The new law, which Indigenous Services Minister Jane Philpott said she will table in Parliament early in 2019, will create rules governing the apprehension of Indigenous children who are deemed to be at risk. It will also affirm the right of Indigenous people to assert jurisdiction over their own child-welfare systems. Indigenous children represent 52.2 per cent of the children in foster care in private homes in Canada, a situation Dr. Philpott has described as a humanitarian crisis. The law is expected to affirm that the best interests of the child will be the primary consideration, that the child has a right to know his or her extended family, that family reunification is a primary goal and that parents should expect due process before their children can be taken from them. Because many Indigenous children are in the care of agencies run by the provinces and territories, jurisdictional issues will have to be sorted out. “Every day in this country, on our watch, someone walks into a home, or perhaps a hospital room where a First Nations or Inuit or Métis mother has given birth, and that baby, toddler or child is taken away from their family,” Dr. Philpott told a news conference on Friday. “They are taken away, for the most part, on the basis of something that is euphemistically called neglect, but, in truth, they are often taken for reasons of economic poverty, inadequate housing, unresolved health issues,” she said. Under policies dating back more than 100 years, the state has taken Indigenous children from their homes. First to send them to the Indian residential schools, then in what is known as the Sixties Scoop, in which children were removed from their communities and placed with non-Indigenous families the 1960s, ’70s and ’80s. A settlement of a class-action lawsuit with Sixties Scoop survivors takes effect on Saturday. The federal government will pay between $25,000 and $50,000 to each of those who were affected, to a combined maximum of $750-million. An additional $50-million will be put toward an aboriginal healing foundation. Dr. Philpott said the children who are now in care are at high risk of homelessness, going missing, being incarcerated and developing problematic substance use and are more likely to become victims of human trafficking, suicide or homicide. Indigenous leaders applauded the plan. Natan Obed, president of the Inuit Tapiriit Kanatami, said the apprehension of large numbers of Indigenous children runs counter to the moral fabric of the country, and the legislation will create systems in which children can be raised in an environment of love. And Clément Chartier, president of the Métis National Council, said he believes the legislation will benefit the Métis more than any other group, because they are not part of the federal government’s settlement with Sixties Scoop survivors and were not included in the federal government’s 2008 apology for the residential-school system.